If college taught me anything, I learned there are two types of people in this world. There are ones that buy cheap beer and there are ones that yearn for something more. I definitely fell into the latter group, choosing to spend my money on a few great brews rather than a case of whatever was on sale at the time. Something tells me that Brewin’ USA’s designer, Adam Rehberg, and I would get along famously at a local taphouse. Rehberg celebrates craft beers through an interesting blend of auction and hand management mechanics with the goal of becoming the best brewmaster. It’s hard to open the sturdy box of Brewin’ USA and not get lost just rummaging through the pieces for awhile. An immense amount of effort certainly went into the details to support the craft beer theme. 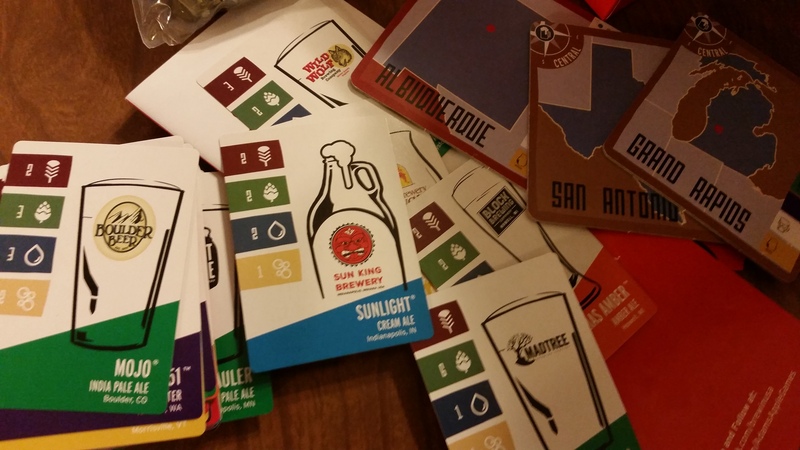 The cards representing the various brews is a proverbial who’s-who of craft beers. Dozens of states have a brewing company represented on at least one of the 82 cards included in the game, though nearly a quarter seem to curiously hail from Minnesota, a destination I apparently must road trip to someday. The game’s money captures the theme as bottle caps represent capital. My only complaint is with the 16 double-sided coasters representing 32 American cities. I understand the space issues involved in using double-sided materials, but that means certain city combinations are unplayable. Everything is here to bring the craft beer theme to life except, sadly, actual craft beer. After ogling the components a while, set up begins. Normally I’d skip over this, but set up is important as it plays a role in the game. Selected city coasters create geographical regions. Controlling an entire region can add bonuses to your victory points at game’s end. Players get beer cards to create their starting hand. The goal is to craft these beers using the specific ingredients listed on the card. Doing so allows you distribute that beer to a city to gain control of it. The game cannot be won or lost depending on the city draw or you starting hand, but it’s important to note that different regions and beers are easier to control or craft than others. The first step to crafting that award-winning brew is obtaining the ingredients you’ll need. Various qualities of hops, water, grains, and yeast from your hand cards combine to create the beers. Unique ingredients like citrus, coffee, or that fall tradition, pumpkin, add special abilities. Ingredient cards are dealt out into stacks, and players bid on the stacks in turn. Players will never have more money than what they have at the start of the game, so being prudent with funds is important. Sure, spending 10 caps on a rich stack in the first ground may give you an early advantage, but it can really ties your hands later on as money trickles in slowly. The only drawback to this design is that a bad ingredient draw can bog the game down for a turn. Some auctions have more than others but saving money for later is a viable strategy. One interesting twist in the game is how the auction money, known as market demand, is dispersed. Every turn has a dealer which set ups the auction for that round. When it’s a player’s turn to be dealer, they get to decide which uncontrolled city receives the market demand, which leads to bonus victory points at game’s end. A shrewd dealer can set themselves up by placing market demand in a city, then taking control of that city with one of their craft beers. Ingredients collected create craft beer as long the prerequisites are met. One IPA, for example, requires three grain, two hops, three water, and two yeast to brew. If you can’t meet the requirements, your stored ingredients roll over to the next round. If you can, the beer is brewed and placed in a city. As long as a player’s beer is on a city coaster, that player controls the city and will gain the city victory points and any market demand that was added to the city. City values vary as those known for their craft brewing, like Seattle and Denver, are worth considerably more than others. Again, those regions created at the start of the game matter too. Controlling every city in a region essentially doubles the market demand from those locations. This time of grabbing the highest value locations makes for a very boring and predictable game. As such, Rehberg added the concept of Brewfests to combat this. Let’s look at Brewfests from the perspective of a player who was frugal in the opening rounds. This player finally crafted a beer only to find that all the truly profitable cities have been gobbled up by the extravagant spending of the other players. Instead of being resigned to last place, the frugal player can start a Brewfest. This is a direct challenge against another player’s controlled city and comes down to little game of high numbered cards. Each ingredient card has a number on it, and those involved in the brew fest pick three of them from their hand. Whoever has the highest combined value wins the Brewfest and control of the city. This small addition to the game helps it avoid situations where an earlier leader runs away with a victory while also helping to break up regional monopolies. The components look great, but bottle caps aren’t known for their stacking capabilities. After the dust has settled on any Brewfests, the last phase of every turn is the accounting phase. It’s the nuances Rehberg put into this phase that make this a good game and not a flawed one. Accounting allows players to draw in some income, but it is tempered. Players receive income either by taking one market demand from controlled cities, gaining half the market demand from any Brewfests that occurred, or scoring money from advanced rules city tiles. Despite those options, income is minimal. This may seem harsh, but it actually keeps the game balanced. If income were any higher, then the big spenders from the early rounds would easily restock and keep the other players out of the action. Again, it’s subtle, but it helps keep players competitive throughout the game. I’ll admit that the game has a particular niche feel to it. When I told others about this game, I got some puzzled looks about a game based on beer. The theme is unmistakable, but that’s a relief in a world where too many games use theme as an afterthought. The important part is knowing there’s a solid game here as well. It’s an amalgamation of hand management and auction mechanics to make for an engaging gaming experience. The theme of Brewin' USA is everywhere with coasters, bottle caps, and dozens of brewing companies stuffed in the box. The theme may not appeal to everyone, but it's worth a look for those that enjoy the crafting culture. The luck of the draw may hinder the auction phase, but the game is satisfying experience.